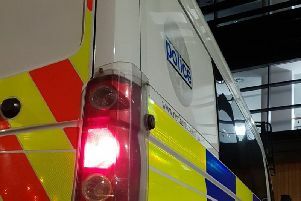 A Corby serial offender who ran down Occupation Road threatening another man with a ‘deadly weapon’ on a Sunday lunchtime has been sent back to jail. Northampton Crown Court heard William Alderdice, 25, had an 11-year history of offending - with 61 crimes on his record dating back to 2007. The hearing was told how Alderdice, formerly of Magpie Close, Corby, had been in a cycle of “prison, release, homelessness, alcohol” for years. Prosecuting barrister Ben Gow said Alderdice, brandishing a 12-inch kitchen knife, was caught chasing another man - who was also carrying a knife - down busy Occupation Road towards Forest Gate Road at 1pm on Sunday, July 15. They were followed by a woman who knew Alderdice. The other man asked a witness if he could get into his car. Mr Gow said: “The witness said he seemed generally scared and in fear for his life. When the police arrived shortly later, they found that the woman had managed to get Alderdice’s knife and had put it in her bag. The court heard how the defendant had found himself on the wrong side of the law dozens of times over the years - with violent offences on his record as well as convictions for possessing offensive weapons, battery, dishonesty, public disorder and threatening behaviour. This was the fifth such offence that involved him being caught carrying a knife. In December 2017 he was sentenced to a year in prison, suspended for two years, for burglary and theft. The latest convictions put him in breach of that suspended sentence. Mitigating for Alderdice, barrister Liam Muir said: “The best way of summarising his life is prison, release, homelessness, alcohol. “He’s extremely keen to out of this position. He’s been trying to get onto a blocker for alcohol. “He knows that the way he’s going he’s got a very limited life left. The court heard how Alderdice had been living in a homeless hostel which had shut down two weeks after he had previously been released from prison, which hastened his downward spiral. The defendant had been engaging with court-ordered probation and alcohol services but had not completed any of an unpaid work sentence he was given. Addressing Alderdice, who pleaded guilty at a previous hearing, Recorder Mark Watson said: “You were described as very angry: you were clearly a menacing threat. “You were armed with a deadly weapon. “He (the other man) was described as very scared. You were described as going to stab someone. Handing down a sentence of two years in jail, plus eight months for the previous offence for which Alderdice received a suspended sentence, Recorder Watson added: “The most significant aggravating feature is your record: a record filled with offences of violence and filled with offences involving weapons. Recorder Watson said Alderdice would serve half of his sentence in jail and half on licence in the community.